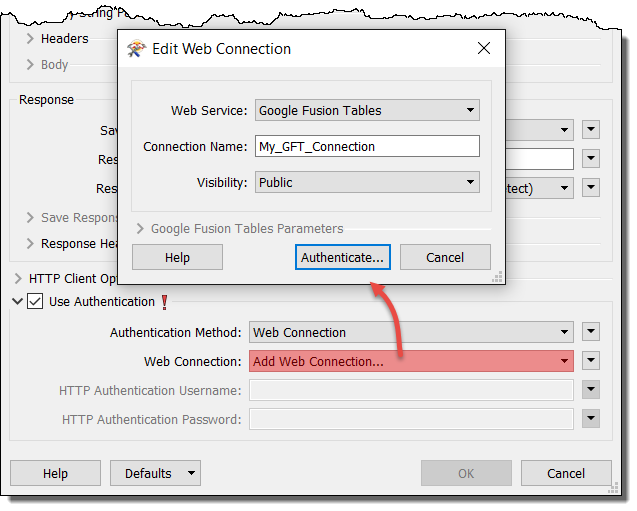 Many processes in FME Desktop require you to connect and authenticate to a web service in order to use them. For example, when you use an HTTPCaller transformer, you may need to authenticate to a web service, such as Google Fusion Tables. Similarly, if you want to connect to an FME Server, you must specify a set of connection parameters. Web connections provide a convenient and secure way to store and reuse these connection parameters. Each time you need to specify the same connection parameters, you can use the connection, rather than re-entering the parameters. If the connection parameters change, you can edit them in one place, rather than in each workspace that uses the connection. When you use a web connection in a workspace, the Navigator displays only the connection name. The service name, username, password, and other connection parameters do not display. For example, here is how connection information displays in the parameters of a transformer that uses a web connection. Additionally, all web connections in the workspace are listed under Web Connections. FME Desktop must be registered to use the web services to which you want to connect. Although many of the most common web services are already registered in FME for testing purposes, we recommend defining your own for production purposes. 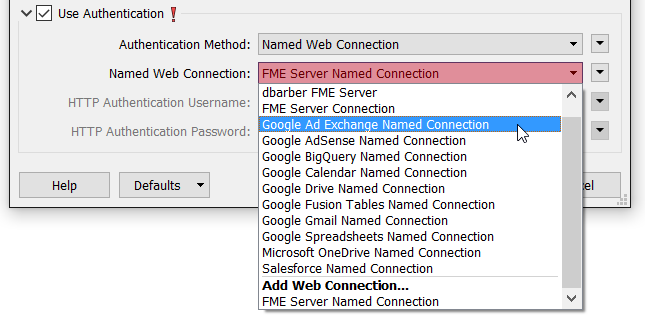 Use Tools > FME Options > Web Connections to manage web services. For more information, see Managing Web Services. It is usually more convenient to add a web connection at the time you are using one in a workspace. However, you can also add a web connection in Tools > FME Options > Web Connections, and use it later in a workspace. You can use an existing web connection, or define a new one, in a Transformer Parameters, Add Reader, or Add Writer dialog, as well as in the Publish to FME Server wizard. 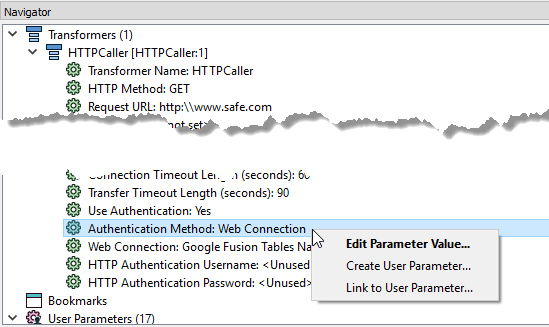 For example, in an HTTPCaller transformer parameters dialog, check Use Authentication. In the Authentication Method field, specify Web Connection. In the Web Connection field, specify the connection. Alternatively, to create a new connection and use it right away, in the Web Connection field, specify Add Web Connection. In the Edit Web Connection dialog, specify the web service, a name for the connection, and the connection parameters. WARNING: For production purposes, we recommend specifying user-defined web services, rather than the pre-registered services already provided. For more information, see Managing Web Services. If the web service uses the OAuth standard, click Authenticate and validate your connection directly with the web service. Visibility: This field applies only if Connection Storage, as specified in Tools > FME Options > Default Paths, is a shared location visible to multiple users. Specify whether the connection is available only to yourself, or to any user of the database (Public). For more information, click Help from the Default Paths window under Tools > FME Options. For more information, see the applicable topic in the FME Transformers or FME Readers and Writers Help. Note: If you did not create a connection, it may not be available for you to use unless its visibility is updated. For more information, see To change the visibility of a web connection. Change a web connection to one that exposes the connection parameters in the workspace. Change a connection whose parameters are exposed in the workspace to a web connection. In the Navigator, right click on the Authentication Method parameter of the applicable object, such as a transformer, that is using the connection, and select a desired method for editing the authentication parameter.